More about The Boot, including location. 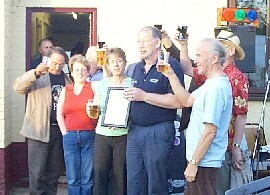 <- Paul Ainsworth, the Branch's Pubs Officer, presenting the Pub of the Year certificate to Kevin and Dianne McDonnell. They thanked their customers and supplying brewers for the support they've had. <- Displaying the award certificate. 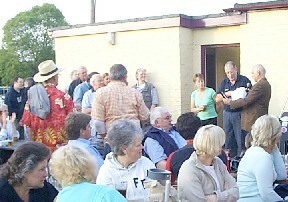 It was an excellent occasion, with beer at £1/pint, a darts match and a "covers" band! For the record, the beers on were Adnams Broadside, St Peters Mild (didn't last long! ), Wychwood Prince Albert and Archers Hey Ho.